Plot: Helen Delacroix can read auras and is a part of a community of supernatural beings: wizards and witches; telepaths and telekinetics; were-creatures and beings that were never human to start with. 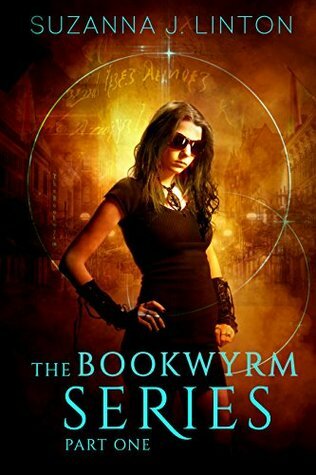 Anything can walk through the door of her store, The Bookwyrm: humans, non-humans, or eerie things that exist in-between. Lately, it’s been nothing but danger. Opinion: This book is said to be “Part 1” in the Bookwyrm Series and it is only about 30 pages long in Kindle formatting, so definitely a quick read. Due to it being so short, there is obviously a lot less of character building, setting, and plot buildup. For a book that is in the Paranormal and Fantasy genre, I am sure you guys can imagine how difficult that actually must be. I am very used to creative and ongoing writing for this genre of book, so I found it a bit refreshing to have a book just get STRAIGHT TO THE POINT. I did enjoy the creative writing aspect in this, Suzanna J. Linton has a nice way of constructing her sentences and describing things in few words. Of course I missed my pages and pages of character development (still not quite sure who Helen, the main character, is or how old she is) and the excessive amount of descriptions in this style of book, but it was a nice change. This book has a lot of potential to turn into a great series once it has been a little tweaked and lengthened. I think the author could have definitely given the introduction to the “magical world” more depth, it felt like it was just dropped into the middle of a page and at a completely random time. I think that should really be a focus for this story, as it does center around magic and the supernatural. But, every great story has a character you can remember right? I couldn’t remember the main characters name until the last page when I went back and checked, which means she doesn’t stand out much at all. Character development can’t hurt you, just ask Stephen King…he puts so much into getting the reader attached to his characters, and then he just kills them. 🙂 Overall, a good start for a series that can really go somewhere amazing. I look forward to seeing this author develop their writing and seeing where it goes.